Washington is counting on a return to our Nation's Capital for a much-needed spark to keep its season from completely spiraling out of control. The Nationals have lost far more games than they have won in the month of August, and as of Wednesday's results they now find themselves 3.5 games in back of New York in the NL East Division race and in serious danger of missing the playoffs altogether. I have been handicapping Washington all season long, and with the use of Doc's Sports Unit Betting System I have also been releasing my free picks for select games. The following is a preview and free pick for this Friday night's series opener of a three-game weekend set at home against the Milwaukee Brewers. Washington will try and build some momentum for a run towards the postseason with a nine-game homestand that kicks things off this Friday night in the first of a three-game weekend series against the Milwaukee Brewers. Game time from Nationals Park is set for 7:05 p.m. (ET), and it will be available on MLB Extra Innings. Milwaukee has been riding out the string for quite some time now, and that was pretty obvious this week in a 2-1 series loss to Miami at home as favorites in all three contests. The Brewers will now have to go on the road where they are 24-32 this season, including a 2-8 record in their last 10 road games. The good news is that the Nationals have won the first two games of a three-game road series against Colorado this week as solid favorites in both matchups. The bad news is that they went 1-6 in the first seven games of this current 10-game road trip. Going back to the first of the month, they are 6-12 in their last 18 games. The Brewers have sunk to the bottom of the NL Central with an overall record of 52-70. While they have been a middle-of-the-road team in the National League when it has come to scoring with an average of 3.9 runs a game, their pitching staff has completely imploded this season with a team ERA of 4.14. They did manage to score 16 runs in the three games this week against the Marlins, but they also allowed a total of 22 runs to one of the lowest-scoring teams in the National League. Look for Milwaukee to send Jimmy Nelson to the mound as its starter for Friday night. The right-hander is an even 9-9 on the year, and he has been one of the bright spots in this rotation with a 3.61 ERA and a 1.22 WHIP. Nelson failed to get the decision in two of his last three starts, but the Brewers went on to win all three games. With the exception of Denard Span still being on the DL, the Nationals are as healthy as they have been all season long. The rust has been obvious with players such as Jason Werth and Ryan Zimmerman after an extended stay on the DL this season, but if Washington is going to have any shot at returning to the playoffs it's going to need better production from a lineup that is now fallen to sixth in the NL in runs scored. It also does not help that its pitching staff is ranked seventh in the league with a 3.75 team ERA. 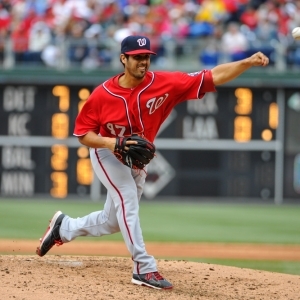 Gio Gonzalez is slated to get the start for the Nationals on Friday night. The left-hander has been one of the most consistent pitchers in this rotation with a 9-5 record through 22 starts, but he did get banged around in his last outing against San Francisco. He lasted just 2 2/3 innings after allowing six earned runs on five hits. His ERA now stands at 3.86 and he has a 1.44 WHIP. BetOnline has opened Washington as a -163 home favorite for Friday night's series opener against the Brewers (+153), with the total line set at 7.5. The Brewers have lost Game 1 in seven of their last eight series and they are 2-8 in Game 1 of their last 10 series with Nelson on the mound. The total has stayed "under" in six of their last nine road games. The Nationals are just 2-6 in Game 1 of their last eight series, but they are 23-6 in Gonzalez's last 26 starts against the NL Central. The total has gone "over" in eight of their last 10 home games. The season series is tied 2-2 with all four games played in Milwaukee. The total went over in three of the four games. Betting on Washington this season has been a challenge to say the least with a negative $1,245 return on a money line bet, but I am counting on a sense of urgency to kick in with a strong start to this nine-game homestand. So much so that I am going with a 3-Unit play on the Nationals -1.5 on the run line this Friday night.